Defence Minister Christopher Pyne has officially confirmed a major milestone for the Army’s $2.5 billion inner tier air and missile defence system. Defence Connect can confirm that Defence Minister Christopher Pyne was joined by South Australian Premier, Steven Marshall, Norwegian ambassador Paul Gulleik Larsen, Chief of Army, Major General Rick Burr, and other senior Defence and industry executives to announce that the National Advanced Surface to Air Missile System (NASAMS) has been selected for the Australian government’s Short Range Ground Based Air Defence program, known as LAND 19 Phase 7B. Minister Pyne and Minister for Defence Industry Linda Reynolds said the government is committed to providing the Australian Defence Force with the best capability to protect Australia’s national interests. "This new air defence capability combines world leading Australian radar technology with a highly effective air defence system that will contribute to the protection of our service men and women from modern airborne threats," Minister Pyne said. The NASAMS acquisition brings transformational change to the Army’s existing force protection capability, including a progression from man-portable GBAD capability to a fully networked and distributed system, these advancements allow the Army to counter complex air threats beyond visual range and significantly increases protection coverage for Australian soldiers. Minister Pyne added, "Australia’s version of NASAMS will use advanced radars designed and manufactured by Canberra-based company CEA Technologies. The CEA radar that has been so successful on our ships will now be integrated into an Australian designed and built vehicle, the Thales Hawkei." Michael Ward, managing director of Raytheon Australia, said, "NASAMS and Raytheon’s unique EO/IR passive sensor gives Australia one of the most advanced short-range ground-based defence systems in the world." System integration and final assembly will take place in the new, $50 million Raytheon Australia Centre for Joint Integration, which will be built in the defence industry precinct of Mawson Lakes. "This centre is a $50 million investment by Raytheon Australia and will incorporate an office block and a specialised integration facility. Importantly this facility will be a change in strategy for Raytheon Australia, the facility will be our first production facility in country and it will become one of the major NASAMS production and support facilities outside the US," Ward told Defence Connect. At the ground breaking earlier today, Ward thanked the South Australian Premier for providing support from the government of SA for the facility. Raytheon Australia anticipated the creation of about 200 jobs over the next year during the construction of the building and an estimated 300 additional jobs in the coming years for those working on LAND 19 and other integrated air and missile defence projects, including the combat system upgrades to the Hobart Class destroyers. "This project is further proof of the government’s determination to build a sovereign and sustainable defence industrial base as a national strategic asset, and is another example of Australian industry playing an integral part in developing world-class capability for the Australian Defence Force," Minister Reynolds said. 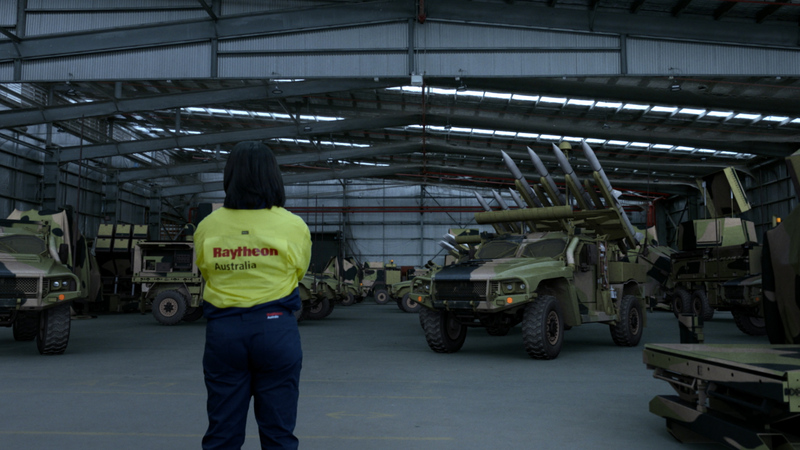 Raytheon Australia and partner Kongsberg are building sovereign capability in this area, as evidenced by their national industry roadshow where the companies engaged with almost 200 local firms. Additionally, Raytheon Australia has ambitions to export elements of the system from the new Adelaide facility. Eirik Lie, President Kongsberg Defence & Aerospace AS welcomed the announcement saying, "This announcement lays the foundation for further expansion in Australia and the region. Kongsberg sees more significant opportunities in Australia and have been a partner to the Australian Defence Force for 30 years starting with the Penguin anti-ship missile program. We opened an office in Canberra last year and is increasing our staff in the country." "LAND 19 will provide the inner tier of the air and missile defence capability with the Hobart Class providing the outer tier of the national air and missile defence. As a result of this, Raytheon can say that the integration centre will be focused on force protection with a focus on supporting Australian industry content and we are proud to say that our solution for LAND 19 will incorporate at least 50 per cent Australian industry content," Ward added. NASAMS is a short to medium range air defence system owned by nine countries and has been integrated into the US National Capital Region’s air defence system since 2005. In addition to the US, Norway, Finland, Spain, the Netherlands, Oman, Lithuania, Indonesia and one undisclosed country have chosen to depend on NASAMS for homeland defence and the defence of critical assets. Raytheon is a technology and innovation leader specialising in defence, civil government and cyber security solutions. With a history of innovation spanning 97 years, Raytheon provides state-of-the-art electronics, mission systems integration, C5I products and services, sensing, effects and mission support for customers in more than 80 countries. Frontline Manufacturing achieves ISO certification... - 12 hours ago.